After over three months in North Carolina, I have returned to Dar, Carolyn in tow. The journey back was surprisingly easy. Although I did not get a wink, the slight hum and vibrations of the jet engines lulled Carolyn to sleep for almost 24 hours. Thank goodness too because we were traveling alongside Ann Curry. I sure would hate to disturb someone famous! Ann was lovely. She doted on Carolyn and got a big, toothless smile in return (gosh I wish I had that camera handy…or the guts to snap a picture if I did). She later reported on the famine crisis in Somalia (here and here if you’re interested) and she tweeted about the plane ride (here). However, on both accounts, she neglected to mention the most newsworthy item: Baby Sleeps Through 24-Hour Flight; Disturbs No One. In all seriousness though, Carolyn’s news was nothing compared to Ms. Curry’s. Carolyn is happy and healthy, and even if she did cry for 24 hours straight, she and the other passengers would still be better off than most anyone in Somalia. Something doesn't add up. Also, I love that there is a check mark beside this equation. Matt and Carolyn were quickly re-acquainted after over a month apart. Most importantly, Rutledge met Carolyn. It was a highly anticipated event that turned into a non-event, when Rutledge sniffed her briefly and then moved on. We found later that while Rutledge is neutral when it comes to Carolyn, he is extremely interested in her toys. Perhaps this is good news for the shoes I brought back with me? He also loves her dirty diapers, one of which has already been ingested. The diaper pail will arrive any day now to save Rutledge from future diapers which will certainly lead to his demise. The expanding properties of those disposables cannot be good for the intestines, but they sure taste good going down. The day after arrival, Carolyn proceeded to make up for her good behavior on the airplane by crying for 48 hours when the anti-malaria medicine did not agree with her. But that’s ancient history. We’re all settled now, almost over jet lag, and enjoying the wonderful winter weather in Dar. Carolyn has since taken the anti-malarials like a champ and is doubly protected by the trusty mosquito net. 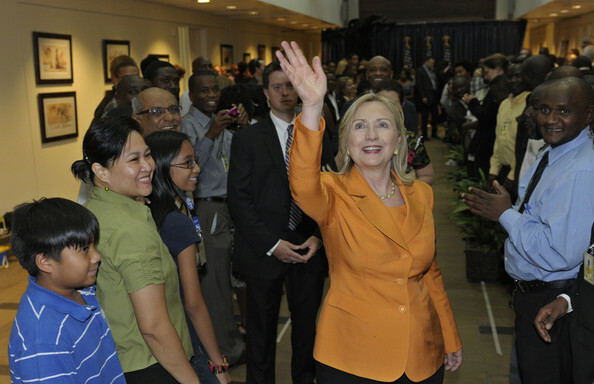 Hilary Clinton made an official visit to Dar es Salaam. She visited the site of the old embassy and laid flowers at the memorial where the 1998 bombing occurred. She also planted a tree or flower of some sort. Details are hazy. An electricity shortage that began in December continues. Power rationing leaves many without power for 20 or more hours a day…(cough***cough) except for those who have generators. There is also a fuel shortage resulting from a dispute with BP and Tanzania’s energy regulators. I’ve yet to wade into the long lines at the pump and will delay that adventure for as long as possible. I hope these guys enjoy watching my daily jump rope routine. That’s it for news in Dar. More coming soon. Mary – so glad you and Carolyn made it safely back to Dar. I’m so sad we couldn’t make it to NC to see you while you were here and meet that beautiful face! All trips South revolved around finally renting our house! Please, please, please let me know what you are needing for Baby Carolyn! I am disappointed that I didn’t get to this before you left! Oh Rutledge! He is one of a kind for sure! Oh – we actually had a 5.8 earthquake here in DC yesterday! Everyone is ok but it did shake up the normal routine! Yeah, I feel out of touch living over here too, except I do get to watch Ann Curry at 3:00pm on the American Forces Network. Yay military TV! Don’t know where I’d be without it. I love the photo of Carolyn and Rutledge sleeping on the carpet. Thanks so much for the account of the trip home, Carolyn is a good traveler. We are so eager to meet her and to see all of you when you come home next spring. More photos of Carolyn and Rutledge, please! The recent storm gave us another good rain and did not damage our trees so things are looking good in “our back yard”! Sounds as though you are really enjoying your adventure.